Elite E Services is looking for Barclays / BARX traders who have traded live on the BARX platform for a black box development project. In order to qualify for this project, you must have traded on the BARX platform with real (live) money for yourself or on behalf of your company or your employer. This project is extremely lucrative and well funded! Why we believe this is partly due to an ignorance of history, which features literally countless defaults, among nations great and small. Even the US has done it.More than once. It happened right at the beginning, in 1779, when the fledgling US nation defaulted on its first currency, the Continental (which led to widespread use of an early American pejorative phrase: “not worth a Continental.”) And a very recent example was when Nixon severed the tie between gold and the dollar in 1971; that was a default on the precious metal debt the country owed to France and others. Bonds are not unique in this regard. Switzerland, Denmark and other countries are now charging deposits at their banks. France and Italy have banned any transaction over €1,000 Euros from using physical cash. Spain has already banned transactions over €2,500. Uruguay has banned transactions over $5,000. And on and on. This is also at work in the US. Louisiana has made it illegal to purchase second hand goods using cash. This is just the beginning. The War on Cash will be spreading in the coming weeks. The reasoning is simple. Most large financial entities are insolvent. As a result, if a significant amount of digital money is converted into actual physical cash, the firm would very quickly implode. This is true for banks around the world. European banks as a whole are leveraged at 26 to 1. In simple terms, this means they have just €1 in capital for every €26 in assets (bought via borrowed money). If a significant percentage of their depositors took their money out of the bank, the bank would violate its capital limitations at best and implode at worse. The US financial system isn’t any better. Indeed, the vast majority of it is in digital money. Actual currency is just a little over $1.36 trillion. Bank accounts are $10 trillion. Stocks are $20 trillion and Bonds are $38 trillion. And at the top of the heap are the derivatives markets, which are over $220 TRILLION. Notice that less than 1% of the “wealth” in this system is actual physical cash. Now imagine what would happen if investors decided to move their money out of the system and into physical cash. This is precisely what imploded the money market system during the 2008 crisis. If you think the banks aren’t terrified of what this market could do to them, consider that JP Morgan managed to get Congress to put the US taxpayer on the hook for it derivatives trades. Mind you, this is the same bank that is now refusing to let clients store cash in safe deposit boxes. This is just the beginning. As anyone can tell you, it’s all but impossible to move large amounts of money into cash in the US. Even the large banks will routinely ask you for 24 hours notice if you need $10,000 or more in cash. These are banks will TRLLLIONS of dollars worth of assets on their books. The markets have evolved over time to bring us to where we are now (as if anyone knows where that is!). How markets evolve is largely misunderstood by the general investing public, certainly by the regulators, and the general populace thinks the markets are nothing more than a high brow elitist conspiracy to strip their assets and take their rights. And to a large degree, this is true. Markets have become so fast moving, so computerized, we often lose focus of what the markets really do - what our market based system does and is supposed to do. Let's take politics for example - there are those who think US democracy has been 'bought' by the 'deep state' and doesn't exist anymore, since the 2000 elections and advent of electronic voting machines, is real democracy possible anymore? Of course it is - and always was. But the lie the establishment feeds the populace, as always - is 95% truth. It's the 5% that is the real game changer, like discovering a new physics that explains the 95% of dark matter in the universe. The 5% truth the public is missing - it is 'one dollar, one vote' - not 'one person, one vote.' Remember, the 'founding fathers' of America were a bunch of slave owning Freemasons that wrote 'all men are created equal' (excluding of course, women, blacks, the indigent, foreigners, American Indians, and any other group that was not a white land owner). Yes, of course - America was the beacon of light and free trade compared to the darkness that existed in Europe at the time - just bring these facts to bear! The market really is chaos. The only real solid financial structure created in the last 500 years is a central bank and how money is created. But introduce Forex, and that structure goes right out the window! Market structure evolves by simple capital trial and error; sometimes at the great detriment to the investors. Imagine for a moment - the investor doesn't own the securities, the capital does. Imagine that capital itself is a virus, an organism by itself, that is actually manipulating humans to buy and sell stocks; to make investments (for better or worse). If you think this metaphor is far fetched, look into the toxoplosmosis that controls our brains to the liking of our furry friends, our cat pets. Another metaphor appropriate which is more commonly known in Philosophy is from Eric Fromm's "To have or to be?" - basically to paraphrase the concept in one sentence, as we acquire material things, it is the things that own us - not the other way around as most owners believe. Do you own the stocks or do the stocks own you? This capital as a virus has no purpose, other than to self-replicate, expand, and find other ways to manifest itself. Traders are the host. Traders and investors facilitate this capital-virus to test different ways to behave, and to eventually create new environments to exist. Take the recent expansion of stock trading into dark pools. 20 years ago, if you had told any trader that a great majority of equity trading takes place automatically by robots (algo trading) in 'dark pools' which are not public and no one knows exactly what goes on inside, it would be laughed at as market science fiction. But now we are even far past that! In the process of trial and error, there are extremes - big winners and big losers. Fortunately, the winners are happy to be greatly infected with this virus, and the losers have certain ways and means to recover losses, such as by participating in class action securities litigation. And it should be noted that securities litigation is a significant part of the market based system, without which many cheaters would go unchecked, thus the system would be eaten by dangerous cancers. Also fortunately, our legal system has evolved to facilitate market evolution, by allowing for market rules to be established, and for cheaters to be punished. The market structure is defined by its behavior on a daily basis, from market participants, by trading and investing. Not by a grand design, and certainly not by regulators! Although the regulators, are a significant market participant from this perspective. To put this in deeper perspective, let's think a little about the most unstructured and most significant market in the world; Forex. Forex markets are completely different than other markets! We know this, but few understand how deep the Forex rabbit hole goes. Are the foundation of ALL other markets, and global trade! Although this is the case, in terms of market structure, equity markets (especially US markets) are significantly more structured than Forex, and have gone through magnitude thousands of evolution generations to produce what they have today. If markets had an 'age' - Forex is a baby, and the stock markets are a wise old man. Slowing the evolution of Forex, there are few pure speculators in Forex (as opposed to the stock market, where near 100% of investors are speculators in one form or another). And those who have the large amounts of required capital to invest in Forex in a significant way, largely have some ulterior motive (such as politics, or to 'corner' a small currency market), or choose not to speculate in Forex (they use it as payment system and for hedging). Literally, the markets are the cutting edge of our global societal evolution, and have become an entity of their own. It could be argued that the market itself is the first form of Artificial Intelligence. Does the 'market' have an intelligence by itself? Oh - it sure does love all the computers we are building for it (nice and cozy new home)! As the markets evolve, humans will become less and less relevant. Unless in the next years a group of major market participants get together and create a superstructure such asBretton Woods (a very unlikely scenario), the market evolution will accelerate. New emerging markets will thrive and die, new instruments such as Binary Options and other derivatives will change how participants look at trading. Goldman will create new fangled derivatives creating super-bubbles and topple dictators and open new markets. Speculating on what the outcome of chaotic evolution process will look like is preposterous. Discussing market structure and what measures we can take to 'stabalize' markets is also preposterous. The idea that we can get all in the world to 'agree' on a 'comprimise' of what the markets (including Forex) should look like, is not feasible. That's the whole idea of the markets! Traders all disagree - and voice their opinions with their capital. What is practical - what is feasible. Prepare yourself! Educate yourself! Do your own investing! Build your own algorithms! Get active legally if you have a big loss! If we don't prepare for the coming high tide, we may all drift out to sea. Today, FINRA proposed a rule change that could have the greatest impact on private markets in over 80 years. Known as the Funding Portal Rules, they would allow crowdfundingportals to take an active role in the sub $1 million non-accredited investor market currently untapped. These rules – when launched – would work in tandem with the as-of-yet enacted Title III JOBS Act rules to allow unaccredited investors to invest freely in private companies. The proposed changes can be read in their entirety here. Everyone has seen the chart of "Total Credit Market Instruments", which as of its most recent update on March 31, 2015, was just over $59 trillion, or 330% of US GDP. 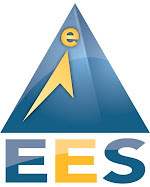 With the September 18, 2015 Z.1 release, the classic presentation of the instrument category "credit market instruments" has been discontinued and replaced with two new instrument categories, "debt securities" and "loans". Reporting debt securities and loans separately brings the Financial Accounts more in line with the international standards for national accounts. The debt securities instrument includes open market paper, Treasury securities, agency- and GSE-backed securities, municipal securities, and corporate and foreign bonds. The new loans instrument includes depository loans not elsewhere classified, other loans and advances, mortgages, and consumer credit. Together, debt securities plus loans include all of the financial assets or liabilities previously included in credit market instruments. While the underlying instrument categories that make up the sum of debt securities and loans are the same as those in old "credit market instruments" concept, changes to a few of these categories make the new sum of debt securities and loans larger than in previous publications. That's the "what", as for the why, note what the Fed said above: "the new sum of debt securities and loans larger than in previous publications." Which means that not only did the Fed stop reporting a consolidated total debt series, it admits that the actual debt was higher. Some $2.7 trillion higher. Total debt outstanding was revised upwards due to methodology changes to both Treasury securities and security credit. Total debt outstanding is now the sum of two new instrument categories: debt securities (table L.208) and loans (table L.214). The aggregate of these instrument categories was previously called credit market instruments. Luckily, for those who still care about such trivial memorandum items as "data" - made up as it may be - and would like to keep track of total US credit exposure, now better known as total debt and total loans, they can simply add up the two line items, with debt (found here) and loans (found here). This is how the old and new data look like: as noted, the consolidated total has risen by $2.7 trillion as of March 31, the last time the Fed reported the "old" series, and is currently a total of $62.1 trillion. The end result is that the ratio of Consolidated Credit to GDP, has quietly risen from 330% to 350%, without anyone in the broader public saying a word and without any of the official institutions, so seemingly concerned about the total stock of global debt, even noticing. And why should they: the S&P500 is back over 2000 so all is well. If you make it so burdensome to operate a legit business, then you're basically giving people without big lines of credit and capital few choices but to work in the cash-only underground economy. This is mostly sub $1500 cars, Building materials or scrap metal. I know quite a few folks that are doing very well in this line of business. A friend mine clears ~$100K just trading in gold, firearms and ammunition. Others I know trade cattle and livestock. Another friend repairs cars at his home. He has weeks of backlog and turns away work all the time. The key to all of this is that these folks have no official business. They trade only in cash. They do not make deposits in the bank except for the government checks. The point is that for these folks, unplugging was a pay raise just in the tax exposure. When they get sick, they claim indigent and get whatever they need. The spread between the burden of regulation and taxes is getting so onerous that folks are just falling into the very solution you describe. I believe your focus is more professional in nature in terms of folks being a hired gun (i.e. free-lancer/contract employee). But what I see are the non-professionals as the ones who are really moving to fill the void of value that is growing as deflation/inflation oscillate. Thank you, B.U., for the straight-up report from the real world. Despite the fact I pay all my taxes (and am royally reamed as a result), I sympathize with those making tax-free incomes in the cash-only economy. Back when I had multiple employees in the 1980s, I was basically working to pay workers compensation insurance (40% to 80% of the hourly wage for construction workers), liability coverage, unemployment insurance, disability insurance, FICA (employers' share of Social Security), excise tax, income tax, rent on the office that we were required by law to maintain, healthcare insurance for all the employees, filling out HUD/FHA forms required when building homes with FHA loans, and so on. Then there's the cost of accounting and tax returns (complicated when you're operating a business), and a long list of other expenses I've forgotten. My partner and I had a stock response when any employee griped about all the money we must be making: we'd take out our keys to the office and offer it to them, and say "payday's on Friday. It's all yours." I'd have been relieved if any had been dumb enough to accept the offer. No one ever did. It's no wonder that legit small business and self-employment is often a struggle for financial survival. I've covered the travails of one serial entrepreneur in launching a new business in today's America: the costs were so heavy that he gave up. It was impossible to actually make a living once you met all the absurd regulations, codes and requirements. The people enforcing the regulations ("just doing my job") are paid by taxpayers; their job is safe, their paycheck and benefits guaranteed. Financial independence is the American Dream because it gives us the freedom to say Take This Job And Shove It (Johnny Paycheck). 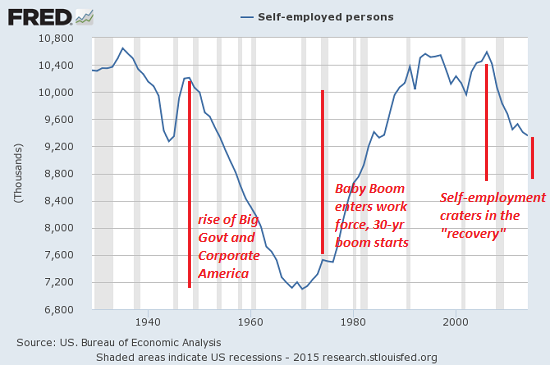 This chart depicts self-employment from 1929 to 2015. 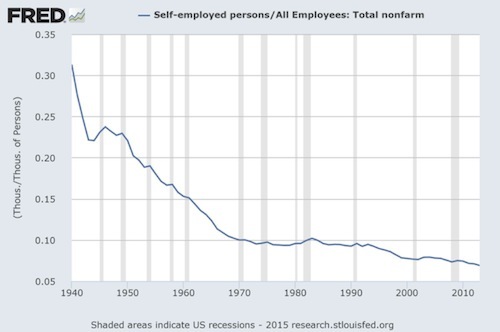 Self-employment is cratering in the "recovery" of high taxes, senseless regulations and burdensome report-filing (big fines if you don't comply), tax preparation, business licence fees, fishing-expedition lawsuits, etc. I have no problem with paying all my taxes for a couple of reasons. One relates to "Render therefore unto Caesar the things which are Caesar's." That's my view, but I don't hold anyone else to it. That's up to them to deal with. Having experienced COINTELPRO in the early 1970s, I know what's it like to be an enemy of the State. Violating tax codes makes you a very easy target for the state. If you want to draw a target on your back, be my guest. I'm going to pass. Anyone who can't find a state/Corporate America job or says Take This Job And Shove It has my sympathy. I've been down to my last $100, and it's a lonesome, troublesome feeling. If you make it so burdensome to operate a legit business, then you're basically giving people without big lines of credit or plenty of capital and regulatory expertise few choices but to work in the cash-only underground economy. Following yesterday's flip-flop on TPP, Hillary Clinton has unleashed some new financial system 'policies' this morning, the most crucial of which includes the provision of a transaction tax which will dramatically penalize high-frequency traders (gratifying critics of HFT's instability-creating market structure). The question is, who is she trying to appease with this 'policy'? The answer is simple - Follow the money... once again. As Bloomberg reports, Hillary Clinton is proposing a tax on the flash boys that may be unlike any in the world. She wants to penalize traders who use super-fast computers to repeatedly submit and then retract their stock orders by charging a fee for transactions they cancel. The proposal, released by her presidential campaign late Wednesday, will gratify critics of high-frequency trading, who’ve long argued that the industry’s reliance on orders that are never executed is a hallmark of unfair markets, and worse, manipulation. While a group of European nations have tried to curb rapid buying and selling by proposing a tax on the volume of trades, charging a fee for canceled orders is a new idea.The plan is designed to target “harmful” high-frequency trading that makes markets “less stable and less fair,” Clinton’s campaign said. She plans to formally propose the tax on Thursday as part of a broader plan to reform financial rules. A trade group for high-frequency firms said Clinton’s plan was misguided because it would act as a disincentive for equity traders who make markets by submitting a high level of buy and sell orders every day. So who is Hillary really trying to appease with this aggressive policy move? Among the fund company’s suggestions: The entire $23 trillion market should automatically come to a halt if a certain number of shares stop trading, giving traders time to regroup on a wild day, according to BlackRock. Tweaking the rules on halts and making all stock openings electronic are among other ideas in a paper published Wednesday by the firm. BlackRock’s proposals come as money managers talk with market-makers and stock exchanges to identify what happened amid the market turmoil on Aug. 24 and how to prevent a repeat. Trading that day was disrupted by delayed openings, more than 1,000 halts, and wild price swings. The fund company believes that many of its recommendations can be adopted with a minimum of fuss. "They’re all very doable changes without a whole lot of magic," Barbara Novick, co-vice chairman of BlackRock, said in an interview. "I don’t think they’re going to be contentious. I don’t think they’re going to be difficult." Simply put, BlackRock hates HFTs because they destabilize their precious ETF business cash cow. With all roads leading back to none other than Cherly Mills... As we asked rhetotically previously, who is really pulling the strings here? Mills was chief of staff for Clinton’s State Department and was general counsel to Clinton’s 2008 campaign. As Politico notes, Mills "has worked for the Clintons for years [and] regardless of whether there’s ultimately an official title on the  campaign, hers will be a key voice." Earlier this year, The NY Post (in an admittedly hyperbolic piece) describedMills as Clinton’s "consigliere" who "knows where the [Benghazi] bodies are buried." Mills also serves on the board of the Clinton Foundation. Ok, so what? Now we know who Cheryl is, but what’s she got to do with anything? And for the answer, we’ll leave you with the following screengrab which should tell you everything you need to know about why Clinton is now going the nuclear route on capital gains taxes... and pushing for a tax that will kill the high-frtequency-trading business. Two weeks ago, the biotech sector imploded after a piece by the NYT'a Andrew Pollack drew attention to the 5000% increase in the price of a toxoplasmosis drug by specialty biotech firm Turing Pharma, whose CEO Martin Shkreli promptly became the poster child for greedy biotech executives who seek to profit on the back of people's misery by gouging the price of life-extending/saving drugs. However, as we subsequently pointed out, what Shkreli did was merely an extension of the far more gradual if far more aggressive hiking in drug prices by every other company in the sector. Indeed, according to a Citron report in which the bearishly-focused research boutique "in the Twitter-storm furor over Turing’s recent one-drug price gouge attempt, the media has overlooked the reality that Martin Shkreli was created by the system. Shkreli is merely a rogue trying to play the gambit that Valeant has perfected." Conveniently, Deustche Bank laid out just what the average wholesale acquisition cost increases by Valeant for its univers of drugs in the past 3 years. We compiled the data to show that even as the US is supposedly drowning in deflation, Valeant had not gotten the memo, and its average annual drug price increase had risen from 21% in 2012 to a whopping 66% YTD. In fact, as shown in the table below, Valeant had clearly put all its biotech peers to shame when it comes to enforced price increases. Then late last week, after looking at Valeant soaring default risk as measured by the price of its blowing out CDS, soaring to over 30% even as its stock prices was surging, we wondered - does someone know something? It appears someone may have known that this weekend, the same Andrew Pollack whose NYT article exposing Turing's 5000% price increase resulted in Hillary Clinton promising to cap specialty biotech prices if elected, has come back for round two and after taking aim at Shkreli and Turing, much to the chagrin of Bill Ackman, Pollack is now taking aim at the biggest culprit: Valeant Pharmaceutcals. Here are some of the highlights from his just released article: "Valeant’s Drug Price Strategy Enriches It, but Infuriates Patients and Lawmakers" which is certain to put the biotech sector right back in the crosshairs of regulators and legislators, not to mention presidential candidates, just as the market was hoping the biotech pricing scandal was about to fade from collective memory. J. Michael Pearson has become a billionaire from his tough tactics as the head of the fast-growing Valeant Pharmaceuticals International. And consumers like Bruce Mannes, a 68-year-old retired carpenter from Grandville, Mich., are facing the consequences. Yes, Mannes' out of pocket expenses will soar, from the $366 he paid in may to $1,800, but guess who will be charged for the balance of the price surge? Why you, dear taxpayers:"Medicare will now have to cover about $35,000 for the 120 capsules he takes each month." Which is also why biotech companies have been able to get away with such prices hikes for so long: courtesy of "buffers" such as Medicare and Obamacare, their impact has been diluted on the back of everyone else. Whom should US taxpayers thanks for this sad state of affairs, in which drug prices are literally hyperinflating? Two people. As we explained last week, most of the reason for soaring prices "devolves from a backroom deal cut when the Bush administration set in motion the Medicare Drug benefit and inexplicably (if you’re not a lobbyist) gave away the rights of the US Government - the nation's largest buyer of pharmaceuticals - to negotiate drug prices with suppliers." The other person: well, the name Obamacare should give you a hint. "My husband will die without the medicine,” said his wife, Susan, who is now working a second part-time job to help pay for health care. “We just can’t manage another two, three thousand dollars a month for pills." Valeant’s habit of buying up existing drugs and raising prices aggressively, rather than trying to develop new drugs, has also drawn the ire of lawmakers and helped stoke public outrage against the growing trend of higher and higher drug prices imposed by big drug companies. This year alone, Valeant raised prices on its brand-name drugs an average of 66 percent, according to a Deutsche Bank analysis, about five times as much as its closest industry peers. For example, after Valeant acquired Salix Pharmaceuticals this year, it raised the price of one Salix drug, the diabetes pill Glumetza, about 800 percent, in two steps. “How can they just do this?” said Gail Mayer, a retired computer systems analyst on Long Island, who said her monthly supply of Glumetza went from $519.92 in May to $4,643 in August. For now, her insurance is covering most of that increase, but she is worried that it will stop covering the drug altogether, as others have. The irony is that what Valeant and its peers are doing is quite logical in the framework of the broken US healthcare system, whose failure has only been compounded with the insurtance free-for-fall that is Obamacare. Mr. Pearson has told analysts that it is standard industry practice to raise the price of a drug shortly before it faces generic competition, which Glumetza might face in February. The drug industry argues that list prices are typically not what health plans pay after discounts and rebates are negotiated, and there is evidence that these discounts are increasing. But even if patients are often shielded, the costs are paid by insurers, hospitals and taxpayers and lead to higher premiums and co-payments for everyone, critics say. There is much more in the NYT piece but the kicker is the chart which will soon make its way to a Congressional deposition room and the latest kangaroo court in which Congress demands a corporate CEO explain how dare he take advantage of the idiotic laws passed... by Congress. What happens next: "last week, Democrats on the House Committee on Oversight and Government Reform demanded that Valeant be subpoenaed for information about big price increases on two old heart drugs that the company acquired in February." Hillary Rodham Clinton, who is seeking the Democratic nomination, called for efforts to control “price gouging” after a public outcry over the actions of Turing Pharmaceuticals, which abruptly increased the price on a drug to $750 a tablet from $13.50. Yes, it will indeed be great to have Hillary involved because as we said two weeks ago, we are very curious "to see how Hillary's populist outrage at [biotech price gougers] will be explained when the public realizes that it is only thanks to the benefits of socialized insurance programs such as Obamacare, of which Hillary is a staunch supporter, that such price gouging was possible in the first place." Finally, just in case the rest of the biotech and specialty pharma industry thinks it is safe and that Valeant will be the scapegoat for everyone's shadow price increases, here comes Bloomberg with "Pfizer Raised Prices on 133 Drugs This Year, And It's Not Alone"
Pfizer Inc., the nation’s biggest drugmaker, has raised prices on 133 of its brand-name products in the U.S. this year, according to research from UBS, more than three-quarters of which added up to hikes of 10 percent or more. It’s not alone. Rival Merck & Co. raised the price of 38 drugs, about a quarter of which resulted in increases of 10 percent or more. Pfizer sells more than 600 drugs globally while Merck has more than 200 worldwide, including almost 100 in the U.S.
Pfizer's saving grace: it's average price hike according to Deutsche Bank was 9%, or "only" 5 times more than core inflation. Will this be enough to placate Congress which is finally realizing the Frankenstein pricing monster the broken US healthcare system has unleashed? The answer will be revealed in the coming weeks.